Hennepin County Regional Railroad Authority is charged with making our transit vision a reality, helping to ensure regional mobility into the future. Light rail and bus rapid transit are essential pieces of our county transportation network. Hennepin County envisions an efficient, fully built-out transit system that works with roads, bridges, bikeways and walkways. The Twin Cities metro area is expected to add another 700,000 people by 2040. More people mean greater transportation demand on an already stressed system. Millennials and baby boomers, the largest workforce and population segments, want access to reliable, affordable transit options, as do seniors and people with disabilities. Transit attracts major employers, new businesses and investments, and helps organizations recruit and retain a talented workforce from across the region. Limited resources will fund road and highway maintenance, not expansion. Transit moves more people, more efficiently, and increases the capacity of the current road network for those who need to drive. Existing or proposed transitways serve 11 of Minnesota's 17 Fortune 500 company headquarters. Light rail systems produce 62% less greenhouse gas emissions per passenger mile than an average single-occupancy vehicle, improving air quality and benefitting the health of residents and the environment. Hennepin County, the Hennepin County Regional Railroad Authority and our transit funding partners have made significant investments in transitways that provide quick, convenient, economical access to jobs, schools, medical facilities and entertainment areas in the county. 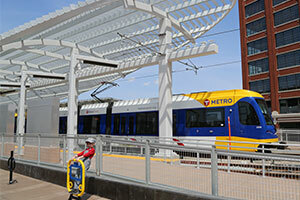 Hennepin County and the Hennepin County Regional Railroad Authority are committed to smart transit planning and investments that serve the county’s residents and businesses. Taken on the METRO Blue and Green lines in 2017, setting new ridership records for both. 29% of all transit rides in 2017, excluding Metro Mobility, were taken on the Blue and Green LRT lines. Near existing and planned LRT stations on the METRO Blue and Green lines, and planned Southwest and Bottineau LRT line extensions. Of new development, not including stadiums, in Hennepin County near existing METRO Blue and Green line stations, with major investment continuing along the planned line extensions. Serves nearly 500 trains each day while welcoming culture and community through public gathering spaces, cutting-edge environmental features and bike amenities. Partners with cities, other organizations and communities to build long-term value around transitways through housing, jobs and placemaking. Transit projects that serve Hennepin County have been funded through a combination of local, state and federal dollars. With state support decreasing, reliable and flexible local funding is now more important than ever. Funding covers capital costs to build transit lines and also operating costs to run the lines. Local funding comes through cities, counties and regional railroad authorities. State funding comes through the Minnesota Legislature. Federal funding comes through the Federal Transit Administration. The county’s half-cent transportation sales tax and $20 excise tax on new car sales, effective October 1, 2017, replace a previous quarter-cent sales tax and similar excise tax by the county for the now-dissolved Counties Transit Improvement Board (PDF). Annual revenue could be as much as $125 million initially for key transit projects. As a unit of government, the railroad authority has the power to establish levies to fund rail transit projects and improve rail transportation in Hennepin County. It holds abandoned railroad corridors for possible future transit use and interim recreational trail use. The 2019 railroad authority budget is $44.6 million with a property tax levy of $36 million. Hennepin County Regional Railroad Authority was established in 1980 to preserve, improve and implement local rail service in the county. It has been key to expanding regional transit options and driving the vision for a complete network of successful transitways. The railroad authority currently owns 55 miles of former railroad corridors for potential future transit use. In the interim, recreational trails have been constructed on all 55 miles – increasing transportation and recreational opportunities for residents. 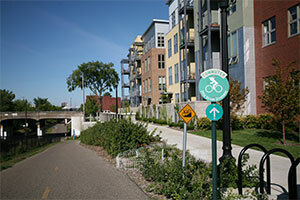 These trails are maintained by the City of Minneapolis or Three Rivers Park District. Although it is a legally separate entity, the railroad authority’s activities are integrated with Hennepin County projects and initiatives. It works closely with other agencies including the Metropolitan Council, Metro Transit, Minnesota Department of Transportation, and Hennepin County cities. Collaboration between the railroad authority, other agencies and a variety of public and nonprofit partners promotes transit development.